I'm so glad you are learning about Brazil's new president. The day after the election the newspapers here in Maceio had a picture of President Lula kissing a Brazilian flag. The election, which took place on Sunday, was a run-off election, because no candidate received a majority vote in the election which took place in September. I saw President Lula on the television news after he won. World leaders appeared on the broadcast to congratulate him. Fidel Castro, the president of Cuba, was one of the people to send a message to President Lula. He's been sick, but he looked really well in the footage. Of course, it was all in Portuguese, so I didn't understand much of the news. People hope he will be a good President, and maybe do things to help the poor, because of his background. Yesterday, I went to a new friend's house for a late lunch. Maria used to cook at the orphanage, but now has her own store (next to her house in what was probably a garage originally). Her house is quite small, but very nice. Part of her kitchen is outside under a partial roof, because it stays warm here most of the year. Anyway, for lunch, Mary made us a lasagna and a yummy chocolate dessert. She gave Kaylea a copy of the recipe, but it's in Portuguese. We'll have to try to translate it, so we can make it in the United States. After lunch, we sat outside in the courtyard and tried to talk to each other...but they didn't speak much English and we didn't know much Portuguese. Mostly we just laughed and had fun. 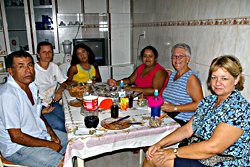 After a while, the adults went inside, and I had a chance to talk to the kids about school and life in Brazil. They mostly wanted to know about America and what Missouri is like. They also wanted to know if we had animals and horses in Missouri. One of the girls is learning English and Spanish in school, so she brought out her English book. It had a small dictionary in the back, and we used it to talk to each other. Are you learning any foreign languages at school? What else have you learned about Brazil (they spell it Brasil here)? I think we are going to try to "tie-dye" with the boys today, because it's a school holiday. I'll try to get some pictures. Maybe the boys will help make me a new outfit! New friends - Debbie Mayberry and Janna Stevens sit with our new friends during lunch. The Kids - These are some of my new friends. We had fun laughing when we couldn't understand each other. The gave me a chocolate Popsicle--which was like a fudge pop. 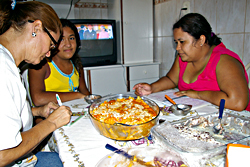 Recipe - Magdalena (another Brazilian friend) copies down the chocolate dessert recipe as Mary (far right) tells her what is in the treat. 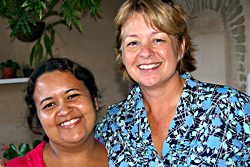 New Friend - Despite language barriers, Mary and Debbie Mayberry have remained good friends for many years.